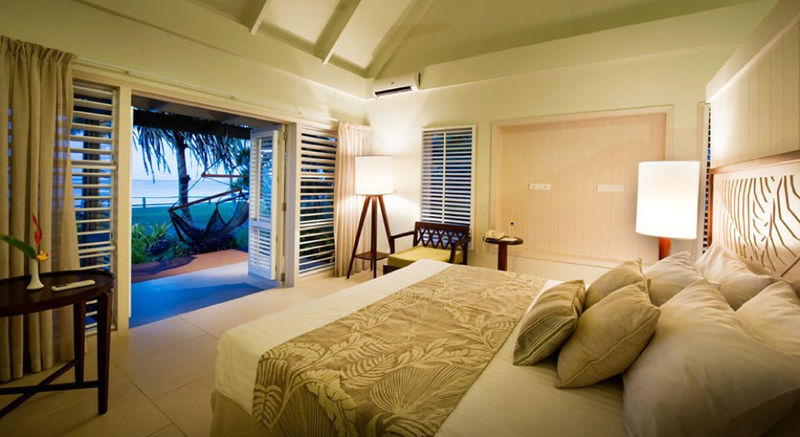 The Fiji Hideaway Resort and Spa is a boutique beachfront holiday resort ideally located on the beautiful Coral Coast, along a beautiful stretch of white sandy beach. Famous for the friendliness and fun of the Fijian locals, the resort offers a tropical setting, perfect for a relaxing holiday with the option to participate in an extensive array of activities if you choose. There are numerous accommodation options from romantic deluxe ocean view bures to family beachfront villas. All resort accommodation is perfectly positioned amongst a palm lined beachfront facing the stunning ocean lagoon – located only a few small steps from your front door. The on-site Day Spa also provides the ultimate pampering experience with a tranquil Reflection Pool and Spa and unique Lava Rock Sauna. Whether you’re after an indulgent escape or an action-packed getaway, the Fiji Hideaway Resort and Spa is the perfect Fijian holiday destination. Hideaway offers varying styles of accommodation from Frangipani (Garden) Bures, surrounded by lush tropical gardens, to Ocean View Bures and Family Beachfront Villa’s and all accommodation is only a few casual steps to the pure white sandy beach of the lagoon. All Bures are air-conditioned, have IDD phones, separate ensuite bathrooms, hairdryers, fridge, tea and coffee making facilities, complimentary toiletries, iron and ironing board. Hideaway has a bed & breakfast plan as well as an all-inclusive plan that includes all meals and all beverages at the bar & restaurant. Also included with both packages are all non-motorized water sport activities and most resort activities. For a wedding in paradise, look no further than Fiji Hideaway Resort and Spa. Exchange vows in Paradise in a secluded setting surrounded by the ones you love. It’s a beautiful wedding setting at one of the friendliest places on earth. To cater exclusively for the wedding and honeymoon market The Fiji Hideaway Resort and Spa has designed and built a traditional Fijian Bure to be used as part of its wedding packages. Hideaway Resort & Spa has a free activity and entertainment program with new and exciting activities operating daily that run from morning to night. Professional entertainment is programmed nightly in the theatre restaurant, by the pool or in the Fire Walking Arena. Activities have been especially designed to enable you to gain the maximum enjoyment from your holiday. Enjoy new discoveries related to Fijian life, try a new sport or simply enjoy the pleasures of doing something you may already be familiar with. The Fiji Hideaway Resort & Spa overlooks the lagoon and is a perfect setting for a relaxing massage, beauty or hair treatment. The health and beauty spa offers guests a heavenly range of spa experiences that promote absolute relaxation and combine natural, quality products and specialised therapists, in a comfortable and soothing environment. The Aqua Lava Rocks is a traditional Fijian sauna and is unique to Hideaway. The Hermit Crab Kids Club is suitable for children 4 – 12 years and is free of charge. Full time babysitting is available for children aged 1 to 3 years, who must be supervised at all times (a fee applies).